Cards/checks may be designated for a particular beneficiary group or left undesignated. Undesignated gift cards are especially welcome and will be used where they’re needed most. Include the value of the gift card (if it’s not printed on the card), a return address so we can acknowledge your gift and send a tax form, and a beneficiary designation if you choose one. Please submit cards/checks by Dec. 21. Late-arriving cards/checks will still be accepted. Questions? Contact Kurt Larrick at 703-228-1775. 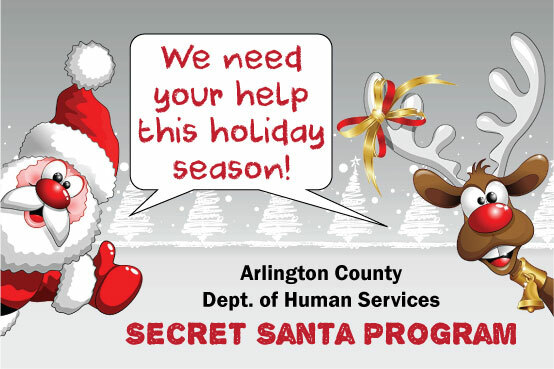 You can make the holiday season a little happier for some of Arlington’s most vulnerable residents by taking part in the Department of Human Services’ Secret Santa Program. Individuals, church groups, schools and neighborhoods have all taken part in the past. Making it a group effort is a great holiday project for kids, families, apartment buildings, sports teams and offices. Children in Foster Care: Arlington has nearly 100 children in foster care. Your contribution of a gift card will help bring a happy holiday to these deserving kids. Most kids in foster care are teens, and it is nearly impossible to get the right gift for a teenager – so gift cards are a great option! People with Disabilities and Seniors with Low Incomes: Making ends meet can be difficult when you are without family and on a fixed income. That’s the case for many older Arlingtonians and members of the community who have disabilities. Our aging and disability services specialists report that gift cards distributed through the Secret Santa program never fail to bring smiles to these vulnerable members of the community. We also distribute cards at the Mary Marshall Assisted Living Residence, which is home for 52 disabled Arlingtonians with low income. Families with Low Incomes: For families struggling to put food on the table, having the money to purchase even modest holiday gifts is difficult. Nearly 4,000 households in Arlington receive food stamps right now which, for a family of four means they make less than $30,000 a year. For low-income households, gift cards from local grocery stores are a big help – and helping a parent buy a special gift for his or her child is priceless. Gifts cards should not exceed $25 each, but you can submit as many as you like. Donations are generally tax deductible. Checks are welcome – please make them out to “Arlington County Treasurer – Secret Santa.” We will purchase gift cards with your donation. Please remember to include a return mail address or e-mail address so we can send you a thank you note and a tax receipt! Why gift cards instead of donating presents or “adopting” a family? Gift cards offer choices, which empowers the recipient. You can select the food you want, the style, color and size of clothes you want, or the perfect toy for your child. The kindness of others is wonderful. But for many, receiving holiday presents from strangers can feel patronizing or demeaning. In a low-income family, a child seeing that a gift comes from a parent strengthens family bonds.